Tax Freedom Day for this year is April 18 - five days later than last year. Today, April 15, is the day in America by which half the population gets to pay its *fair share* to the government in the form of income taxes (the other half pays no income taxes). Oh, excuse me, it is when we are "asked" to pay our fair share. Don't you love the "asked" term ...as if we have the option of refusing without going to jail? 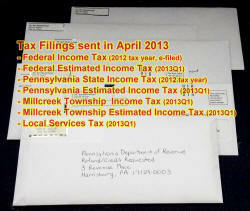 Six envelopes are pictured here (e-filing not shown) that contain various tax mailings for Melanie and me: one each to the IRS for income tax and Q1 estimated income tax, state income tax and Q1 estimated income tax, local income tax and estimated income tax, plus a local services tax. The local services tax is just for the 'privilege' of working - I kid you not. After paying federal, state, and local income taxes, sales taxes on all we bought (including gasoline), utility taxes, taxes on savings, property taxes, school taxes, etc., etc., etc., our total 'fair share' works out to 37.6% on adjusted gross income. So, more than a third of our income was paid in taxes. Just our federal adjusted gross tax alone worked out to 26.6% of adjusted gross. By comparison, according to Whitehouse.gov, "The President's effective  federal [adjusted gross] income tax rate is 18.4%." My total before-tax income was under $100k, by the way, and I do not have a mortgage deduction to claim so personal exemptions for Melanie and me and a small IRA contribution are about it for deductions, so don't get the notion that I made millions and sheltered most of it. Only people like Warren Buffet and companies like General Electric can pull that off. We didn't even contribute to a (deductible) medical spending account this year. RF Cafe does business as a Sole Proprietor, so the business and personal taxes are one and the same. That means we paid about 50% more in federal income taxes than the president of the country paid. Does that make us 'rich' and axiomatically, him poor compared to us? Not factored into the total debt to the governments is the time and expense expended in preparing tax returns. Melanie does our taxes using Turbo Tax, and that involves many hours of effort throughout the year. According to the good folks at CCH, our federal tax code has grown from 400 pages in 1913 to a massive 73,954 pages in 2013 - an 18,388% increase in a century. If lined up end-to-end on standard 8.5" x 11" paper, it would be nearly 13 miles long. Take a look at the chart to the left, which doesn't include state and local tax codes. The tax code will increase much more in 2014 when the socialized medicine programs kick in. Ridiculous, non? Rhetorical Question: Are there really people out there who believe they're not personally paying enough in taxes, or is it just that they think everyone else should pay more?